When I think about Faro, I think about the sun, beaches, parties and relaxation! The great thing about Faro is that it has two faces. 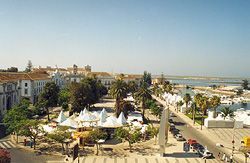 In winter, it is a calm place, although it always has good nightlife because of the number of students from Algarve University present in the city. In summer there are lots of things to do because is filled with thousand and thousand of travellers that give life to the city. If you are a beach lover and a sun lover I definitely recommend that you learn Portuguese in Faro. I go there every year at Easter because at that time of the year in Portugal, and especially in the Algarve, the weather starts to get warm. It’s just perfect – warm but not too warm, and at that time of year there aren’t many tourists so you can get to know the friendly locals well.